This is one of a series of fragments from choirbooks of a type known as Graduals that were made for the San Michele a Murano monastery in Venice. The majority of these fragments were illuminated by a monk of the Camaldolese Order in Santa Maria degli Angeli in Florence, Don Silvestro dei Gherarducci. At this time, Venice was not a centre of illumination. In 1401, the Dominican nuns wanting advice on the making of books were told by Goivanni Dominici, a Dominican from Florence, to study the choirbooks of Santa Maria degli Angeli, which contained Silvestro’s work. The monastery was the home of a number of scribes, painters and illuminators in the 14th and 15th centuries. They worked both for their own house and for other churches and even secular customers. Silvestro may have worked as part of a team with some ornamentation done by others. This particular fragment is believed to be the work of an assistant, the Master of the Canzoni. The fragment shows an initial A for the Mass for Easter Tuesday, with a bearded prophet holding a scroll. The drawing seems slightly clumsy, but the illuminator is clearly working in the same style as Don Silvestro dei Gherarducci. 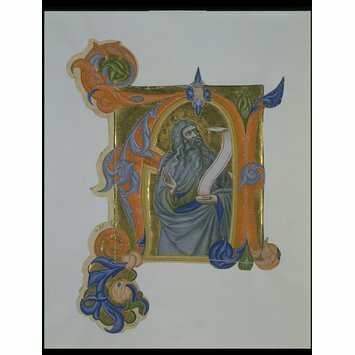 Cut-out historiated initial A in orange, yellow and gold. Acanthus decoration in grey, blue, pink, green and gold stems from the intial. Inside is an saint holding a scroll, set against a gold background, with a long grey beard and hair and wearing a green tunic and blue-lined grey cloak. The initial introduces an Offertory for Easter Monday. Made for San Michele a Murano in Venice. Bought by the V&A Museum before 1859. 240 x 170 ) mm; miniature 145 x 130 mm. 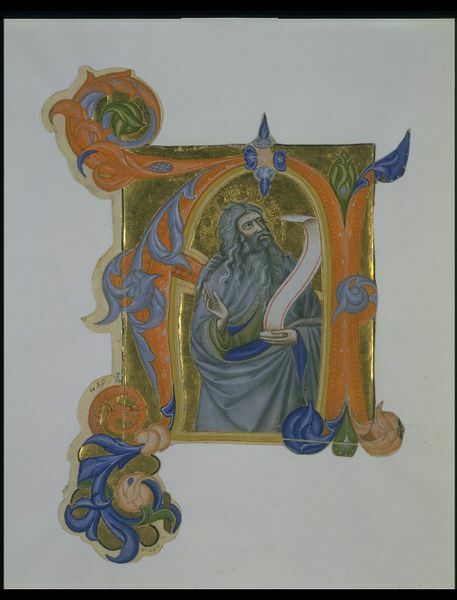 Historiated initial A, saint holding scroll, attributed to Maestro delle Canzoni, Florence, 1382-1399. 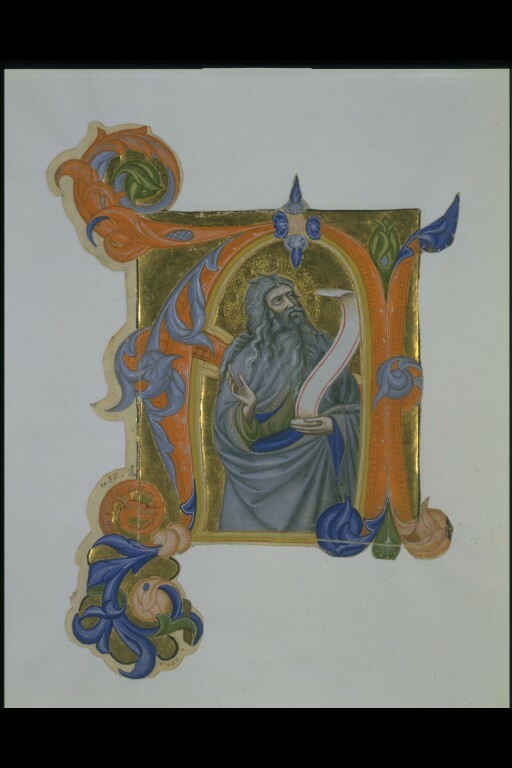 Cut-out historiated initial A (bearded Prophet) from the Gradual of San Michele a Murano, Venice. The attribution to Don Silvestro Gherarducci is by Gaudenz Freuler according to the Metropolitan Museum catalogue of 1994 (information supplied by Anna Melograni).